Join the 6000 alumni of the Shirley Price Aromatherapy College! and CPD workshops. Diploma classes and workshops run quarterly. The Shirley Price Aromatherapy Practitioner Diploma Course is fully accredited with the IFPA (International Federation of Professional Aromatherapists). The IFPA which was co-founded by Shirley Price is committed to excellence in education and you can be assured that we meet exacting standards to provide you with a worldwide internationally recognised qualification. Students may register with IFPA as students and take out IFPA recognised student practitioner insurance to cover case studies. Shirley Price Aromatherapy is based in Hinckley Leicestershire and has been training students for a career in aromatherapy for 40 years. Besides the famous aromatherapy college Shirley Price Aromatherapy is a certified organic manufacturer and handler of essential oils and aromatherapy products. The course is national occupational standards Level 3/4. If you hold a lower qualification and would like to upgrade to IFPA membership then we can help you. We assess what you need to learn and recommend how much more study you need to take. This is assessed on an individual basis. Usually a course of a weeks study is sufficient to prepare the student for the independant examination. 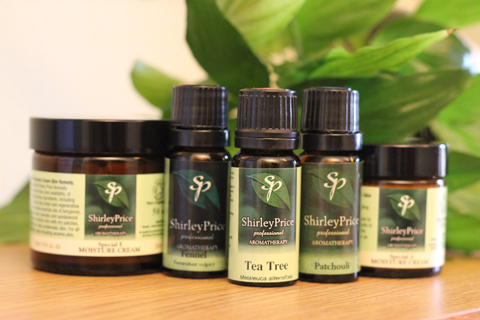 When studying with us you will be entitled to a trade account on all products manufactured by Shirley Price Aromatherapy. Post study we have a Gathering and Sharing Group which aims to help you to continue to develop your own knowledge and join a network of Practitioners. Shirley price Aromatherapy also offers an attractive distance learning course. Successful completion of the course and examination qualifies students to apply for IFPA membership by distance learning. As this course lacks the practical massage training of the in-house program it does not qualify the student for massage insurance.